Built for a wealthy merchant, the Lea is situated in the scenic Waterford Valley, home for many of Newfoundland's upper class in the 1920s. The home is the only Tudor revival style mansion in Newfoundland and Labrador. The Lea, or "Leaside Manor" as it is commonly known, was completed in 1921. The house was built for John Parker and his wife, Flora. Before their marriage in England in 1920, they contacted a local architect by the name of MacCarter to build a house to their specifications. While the house was being built they spent several months honeymooning, returning to Newfoundland only after the dwelling was complete. Parker was one of Newfoundland's better known businessmen. He ran Parker and Monroe, the island's best-known shoe company. Founded in 1880 by James Francis Parker and Daniel Monroe, Parker's son John continued the family business. Along with several outlets that sold shoes and boots, the family also ran a shoe manufacturing plant that produced up to 100,000 pairs of shoes annually. The plant was located on Alexander Street in downtown St. John's, not too far away from the house Parker built for his family on Old Topsail Road. The factory remained open until 1949 and the last store closed in 1988. The house remained as the Parker family residence for decades. John Parker passed away in 1961 and his wife died in 1963. During this time their son, Jay, moved back into the property. He and his wife, Geraldine, raised seven children in the house in the next 30 years. In 1995 the property was sold to Elaine Hann who now runs a bed and breakfast in the house. The Lea was named for its location on Old Topsail Road. 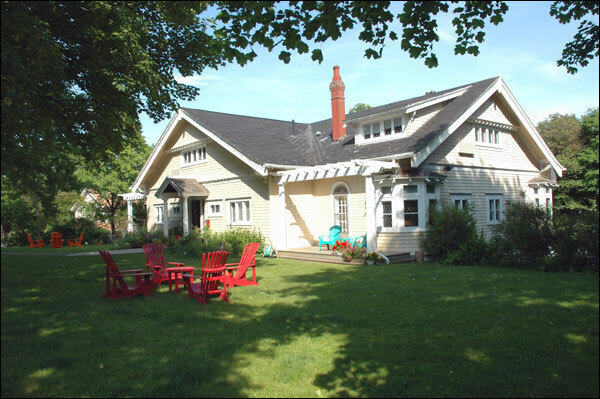 Built on almost a half-acre of land, it is also on the lee, or sheltered side, of the Waterford Valley. The lot of land is also graced with more than 30 maple trees planted by the house's original owner. The Lea is a Tudor-style, two-storeyed wooden house with colonial columns, a styled roof, double-bevelled glass entryway and wrought-iron gates and fencing. Inspired by the low beam ceiling in the Doulton family home in Scotland, one of the unique aspects of the Lea is the large reception hall with its panelled walls. Altered little since it was built the house remains in excellent shape. The Lea was recognised as a Registered Heritage Structure in November 1997. Also view the The Lea Registered Heritage Structure and the Leaside Manor – City of St. John's Heritage Site on the Heritage Foundation of Newfoundland and Labrador web site. The Newfoundland and Labrador Heritage Web Site has on its site only a portion of the registered heritage structures in Newfoundland and Labrador. To view a complete list or search for a particular structure visit the Heritage Foundation's Property Search page.